Spiderman, Wolverine, Thor, Iron Man, Hulk and the Sea Breeze; they are all Marvel creations, but only one will be your true friend on the road — or off it for that matter. 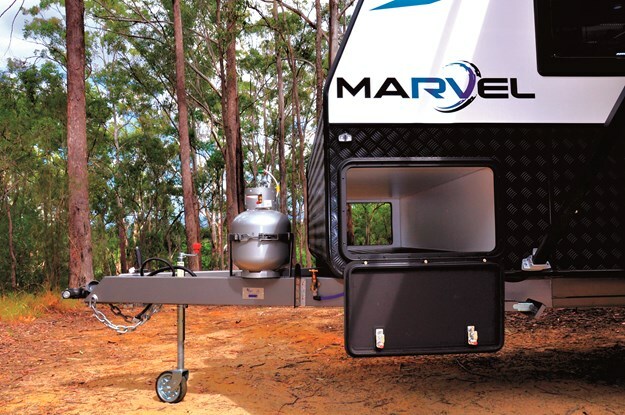 The Marvel Sea Breeze Sport 18 is a strong, offroad caravan that will stay true in your quest for the perfect campsite. It’s good for a long run through thick and thin throughout the rigours of our great Australian continent. I’d like to say it has powers and abilities far beyond those of its rivals, but perhaps my imagination is running away with me. Now, back to Earth. The Marvel Sea Breeze Sport 18 caravan is simply a ripper. For me it’s an ideal size, whether you tow with a large family vehicle, mid-range or large 4WD. Any bigger can become a nightmare and fall into the realm of maxi-towing. Any smaller restricts the facilities, flexibility and comforts for long term touring and in my opinion takes away any opportunity of what I would define as sensible 'offroad'. At around 5m (18ft) and 2.2t Tare plus a realistic ATM at 2.7t, this Marvel muscle machine fits the mould for reasonable weights and measures perfectly, and offers comfortable, luxury accommodation and a host of capable features and accessories that are perfect offerings for extended adventure. I met the boys from Caloundra’s Sunseeker Caravans (QLD) at the foot of the beautiful Glasshouse Mountains for a day of fun and adventure with the Marvel Sea Breeze. From first glance I knew we were on to a winner with its appealing looks, attractive decals and snazzy trim as offsets to a maximised shape. Let's face it, it's hard to make a box look good — but the Marvel team have done it with their aerodynamically curved front wall, black powder coated alloy checkerplate armour that’s higher in the front for increased stone chipping resistance; tough-looking colour-matched alloy mags in chunky all-terrain tyres and a huge array of tinted double insulated windows — plus the smooth external 3mm aluminium composite paneling. Sunseeker’s John Cullen presented the caravan with the character of a true professional who knows his product inside out and top to bottom. “Like a house, if you start with a good foundation, everything will stay true,” he said when talking of the grunty chassis that is the base of this tough trailer. The construction is all box-section DuraGal and fully welded 100x50x3mm Australian BHP steel with a 100mm riser, so it’s actually two laminated beams for terrific integral strength. Out in front the chassis joins through to a further 150x50x3mm drawbar with all of the standard trailer wiring plus a Vehicle Components DO35 offroad coupling, handbrake, removable jockey wheel plus a handy tap for water on the go and a mesh basket that’s useful for some firewood. The strength and sensibility continues with the smooth-sided aluminium composite paneling with polystyrene insulation and one-piece insulated fibreglass roof that's not only hail-resistant, but has low exposure to long term problems with its minimal joins. This Marvel hasn't quite got Spiderman’s agility, but it does stick to the bitumen well and has very good stability in rough terrain. It rides on a single axle AL-KO Enduro Outback independent swing arm suspension with twin shock absorbers and a coil spring either side with 300mm (12in) electric brakes and offroad magnets. It also offers a reasonable departure angle so it shouldn't scrape its bum too easily on steep angles and undulations. The underbelly of the Sea Breeze Sport is very neatly plumbed and wired, and has a shrouded 190L water tank (plus optional grey water if selected) keeping the centre of balance low. The floor is of high quality marine plywood so it’s good for some sensible creek crossings. We ran around the hills and valleys and over a very sharp rise on a forest track before settling in at an idyllic campsite. I must say that the Nissan Navara twin cab 4X4 towing vehicle did it very well. It was just minutes later that we were stabilised and level; towing vehicle disconnected, Dometic awning spread and we were unleashing the camp chairs. “The easier it is, the more often you’re going to use it,” aptly commented John. We unlocked the triple-lock security screen door to reveal the Sport's softer internal charm, and it was quite beautiful. This is a fully-loaded 18ft burger with the lot, featuring an enticing display of colours, laminates, surfaces, layout and finishes with post-formed, rolled-edge benchtops, structural plywood doors, acrylic splashback, Sure-Grip brushed chrome and stainless fixtures, all offset by huge windows and gloss white internal lining. The colour scheme in this demonstration unit has a rich grey/graphite trim with premium acrylic finish to doors and drawers, matching faux-timber laminate flooring with felt backing, and a lushly cushioned automotive grade leather cafe-dinette with tri-fold dining table. I really liked the flip-out footrests at the end of the dinette chairs making a comfortable couch, almost a recliner. It is just the thing to rest tired old bones, or maybe to laze away a rainy day with a good book, game or even watching the 12V 24in TV. There is an option for a convertible dinette if further bedding is required for kids and visitors — or maybe just the dog house! I sat down to enjoy the layout and was pleased to find the large Thetford tropical class two-door fridge freezer with thematically controlled fan and auto power selector, that will swap its fuel source from power to gas automatically if you run out of gas or have a blackout. Lesser fridges, particularly those tiny bar units, just don’t cut it for me. If you're going to travel for an extended period the Swift full-sized oven with grill and three gas and one electric hotplate is just the ticket. There’s a stainless steel 12V rangehood, plus for those quick meals on the go or to thaw out a few steaks, a microwave sits neatly above the fridge. The storage and cabinetry is superb with plenty of cupboard space including overheads, under-bed, lounge and kitchen with metal-sided drawers and piano hinges on all swinging doors. The kitchen is finished off with a large stainless steel sink with drainer, flip top hot/cold tap and an abundance of 12V, 240V and USB outlets. 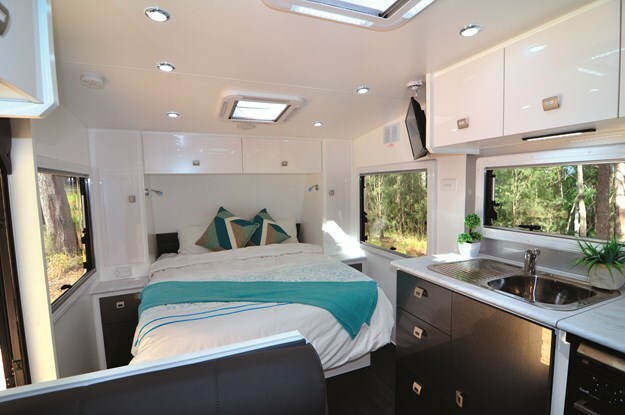 The interior feels exceptionally spacious with terrific design, sensible easy-to-clean surfaces and enhanced by large double insulated Euro-style windows with sliding heat-reflective awnings and flyscreens. air-conditioner to keep you warm or cool. Marvel has fitted a neat electronics cabinet in one of the overheads; there you'll find switches and fuses for the 12V system, water pump, gas/electric hot water system with 28L holding capacity; water tank indicators for both of the 95L tanks, a Fusion Bluetooth/CD/MP3 headset and the solar system's charge controller. Keeping the power up to the twin 100A deep-cycle batteries are the Anderson Plug to the towing vehicle, 300W of solar panels on the roof with 30A solar regulator and 30A 12/240V charger. There’s even an external compartment big enough to carry a portable generator if you so desire. “We will run outta beer before we run out of power!” laughed John. After all the day’s action, the large queen bed looked mighty inviting. It features a 6ft 2in x 5ft innerspring mattress on a posture-adjustable slatted frame with gas struts allowing easy access to the cavernous storage below. It’s an island style bed so there’s no annoying scramble to get in and out and it allows terrific access either side. The bed is a fixed length so no annoying bolster either! There’s a good range of cupboards and wardrobes surrounding, but not intruding into, the bed area, and plenty of 12V and 240V powerpoints. The bedroom is finished off with individual lighting plus the remote to the ceiling lights, and a bedside table either side. You are just gunna love the ensuite! 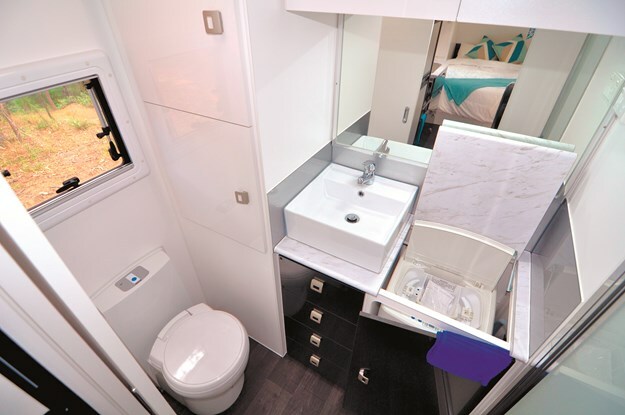 It is simple, clean and very efficient with all the creature comforts. There’s a Thetford porcelain cassette toilet with elbow room for big fellas, and a 3.5kg washing machine: “So you’re not paying good money to wash your clothes in a machine that's just washed someone’s dog blanket!” said John. 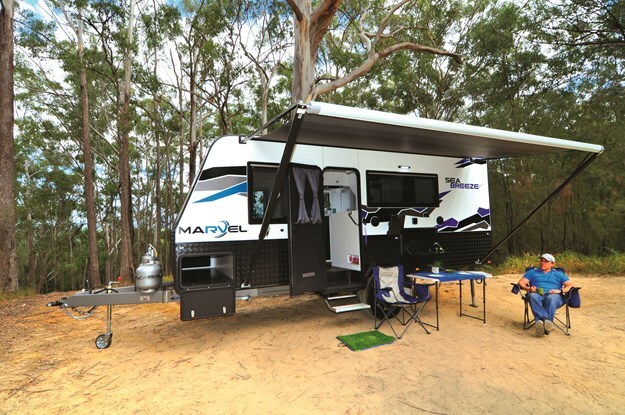 Marvel’s Sea Breeze Sport 18 is certainly a very comfortable home away from home, and one that you can expect to take to some pretty remote destinations over Australia’s rough and tumble. It's a premium build on strong foundations and comes with all the DNA of a great tourer. You won’t have to be a Marvel superhero to tow the Sea Breeze, nor become a villain and rob a bank to pay for it. Marvel and its Queensland agents Sunseeker Caravans offer a number of layouts and models from 5.54m (18ft) to 6.70m (22ft) with both single and dual axle trailers, and a wide variety of features, layouts, colours, trims and accessories. Check 'em out for your next Marvel-ous adventure.